When I read Amy Lepine Peterson’s post about her favorite childhood missionary book this week, I had to pull this book from my bookcase and dust it off. The Girl Who Wanted to be a Missionary was part of the Church of the Nazarene’s Caravans program, which was sort of like Christian Boy/Girl scouts. It was also part of the Children’s Mission Curriculum. The fact that I still have means it is pretty important. I remember it being one of my favorite books as a kid. I re-read the book last night. It told the story of Susan N. Fitkin, who started the world mission society of the Nazarene Church and was its president for many years. Susan was a minister and evangelist who worked to raise money for and awareness of missions work overseas. Though she never got to be a missionary herself, she was an integral part of the Church of the Nazarene’s missional focus. By the time I finished the short chapter book, tears were running down my face. My reaction was part nostalgia, part guilt, part sadness, part thankfulness. I grew up in a denomination that felt like a family, and for that I am grateful. My family’s story is part of the Nazarene canon. Though we are no longer a missionary family, my parents’ work in Thailand lives on. I see it every day in Facebook posts from my friends there. Still, there’s a feeling of brokenness, too. There’s the guilt from walking away from this “family,” and there’s the ache of my own struggles with faith and doubt. Sometimes it feels like after everything my parents did over there, after all the sacrifices they made, after all the work they did in the name of Jesus, God slapped them in the face. The truth is, I don’t know what to do with these feelings. 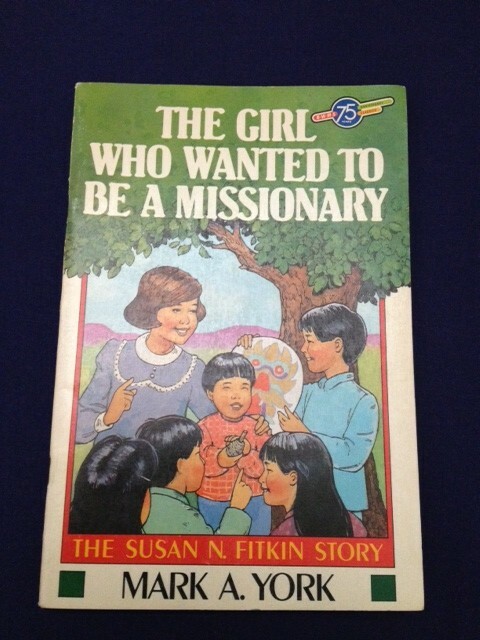 The truth is, I used to be the girl who wanted to be a missionary, too. But now the words evangelism and evangelical don’t seem to mean what they used to mean, and instead of giving me purpose, they just make me feel lost. My daughter is nine years old. When I was nine, I already knew what missionaries were. The song People Need the Lord was the soundtrack to my entire life. I knew that the 10/40 window was an area of land between 10 and 40 degrees North that was the world’s least Christianized and also hardest to get into to do mission work. I already knew that in a year or so, I was moving to Thailand. My daughter’s life seems so small compared to mine at her age. She’s never been overseas, and she hasn’t heard many missionary stories other than my own. Her parents aren’t at the top of the ministry hierarchy. She lives in a place where most people speak her language. Here is what I have to come to: It’s okay that my children’s experiences are not like mine. It’s okay that they are growing up in a different church, in a new era, with teacher parents, not missionary ones. It’s okay that they won’t have stories of living in a place where there are Flood Days off of school instead of Snow Days. They will create their own stories. They will tell their stories, of belief and unbelief, of family and frustrations, of baseball and books. They will use vocabulary that is different than mine and will cling to words that remind them of their youth. They will make their mark on the world with their own words. Until then, I’ll just keep telling them my old stories, with my old words, words that ring of both sorrow and joy, with hope that some of them land on my kids’ hearts. Your post made me cry for some of the same reasons. My brother was born in the Raleigh Fitkin Memorial Hospital in Swaziland. I never knew the backstory before reading your post. Thanks for sharing. Karen – I had no idea! Small world. Yeah, she started NWMS, which I think is now NMI. What were your parents doing in Swaziland? I think what’s hardest for me to figure out is how to talk about missions and evangelism with my my kids without making it seem like it’s the pinnacle of a “ministry hierarchy,” to use your phrase. And if I’m honest, I still think almost every week about moving overseas again. A large part of me wants my kids to grow up in a different culture than this one. Thanks for sharing these reflections! Yeah, I probably should have put that phrase in quotes. Oh, well. I struggle with the concept of evangelism now. Part of the Christian subculture (at least in the 80s and 90s) was this idea that we should be witnessing to everybody everywhere. I guess I don’t really think of evangelism as that anymore. I tend to think of it more as just showing Christ’s love to people in a variety of ways. So it’s hard for me, too to talk to my kids about it. And I would love to move overseas, too. My mom would kill me, but I wish my kids could have that experience. It’s uncanny that I’d encounter two discussions about Steve Green in the same day, both from MKs no less! I was just chatting about him in a Facebook group for MKs. It seems several of us can tie his music to specific MK-related memories. Years later, in his 50s, Dad developed dementia. Although he was quite sick, he was still able to enjoy a live Steve Green concert with me in 2008. When Steve got around to “People Need the Lord” Dad tried to sing along, forgetting many of the words. He didn’t seem bothered by it, and seemed to enjoy the moment anyway. And I, meanwhile, could barely hold back the tears. Dana, Thanks so much for reading and commenting! I look forward to reading more on MK Planet. Somehow I NEVER KNEW that Steve Green was an MK! Or maybe I knew and just forgot . . . getting older!! I am so glad that you and your dad were able to meet Steve. I think maybe he came to my college and did a concert once when I was in college. My dad sang many of Steve’s songs in churches and would love to meet him! That song was such a cornerstone of my youth. I don’t think I’ve met another MK whose Dad was also a singer. Very cool, Karissa. And thanks for your comment as well. I look forward to reading more on your blog! Karissa – My dad taught a one year medical training class at the hospital on two occasions. One was before I was born and the second time I was two years old while we were living there, my brother was born. My first memories were in Swaziland.